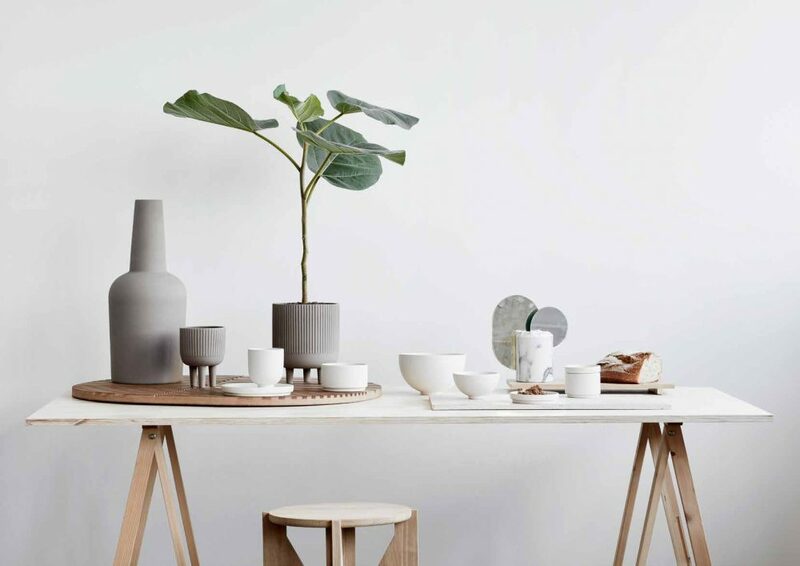 I have been a fan of Danish designer Kristina Dam for some years now, ever since I discovered her work at Maison et Objets in Paris. It’s because of her pure and simple lines but even more so beacuse of the clever characteristics of her designs. 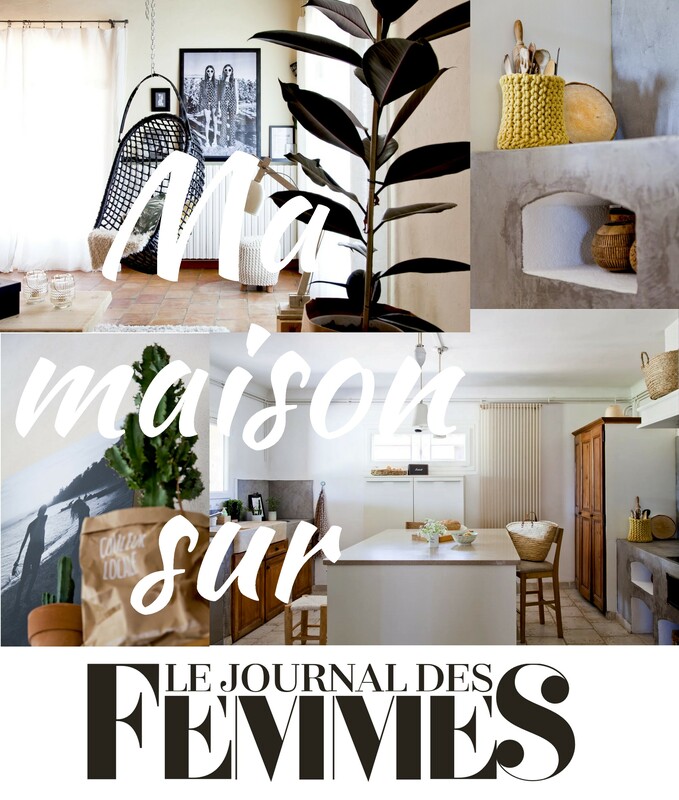 Sometimes her designs seem obvious but that’s exactly her strenght, she is the one to have imagined them! The collection that Kristina Dam presents for 2019 is quite extensive and also includes the new ‘Japanese Collection’. 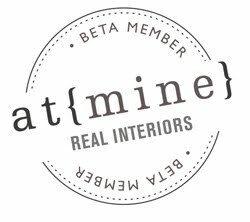 I took the liberty of making a personal selection of favorites, objects that I would easily see in my own home (yes please!). I hope it will inspire you to go explore the rest of the collection, maybe to discover your own favorites. Creative and thoughtful plating and presentation enhances both the look and taste of your food. 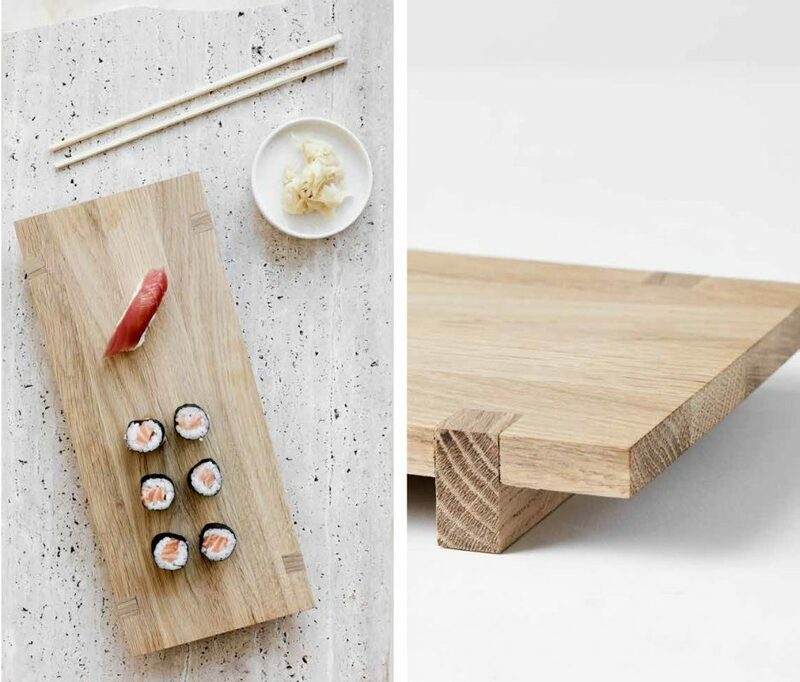 Use the elevated wooden board to serve tapas or small dishes for your guests. 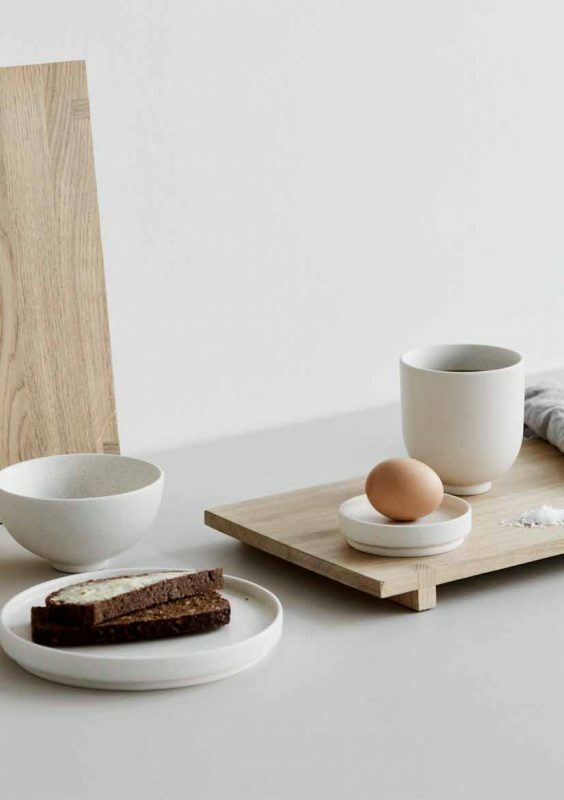 Place the new Setonomo Bowl set on the board using it as a wooden serving tray. Can also be used as a cutting board. Here’s a product that ‘overflows’ in simplicity. That’s why I love it but also for its diversity! It’s a board that will be very Instragramable, don’t you think? The wooden board comes in two sizes. An elegant and thoroughly designed piece of flat pack furniture. The Stool is stable, easily assembled and most of all functional. Use it as a side table or as a chair or ottoman. Every home is in need of a stool and with this handy piece of furniture you will furthermore have something beautiful to look at. Table Use it as a side table or to display your botanical collection or art pieces. Flatpacked and assembled without any use of tools. Available in oak or black painted hardwood. 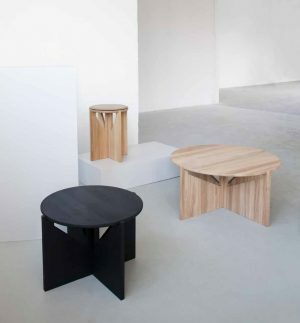 XL Table Based on the same design as the Stool and Table, the XL version is perfectly suitable as a coffee table. Even though it is big it is easily assembled without any tools and comes flatpacked. Available in oak or black painted hardwood. The tables are quite thick, In my opinion. 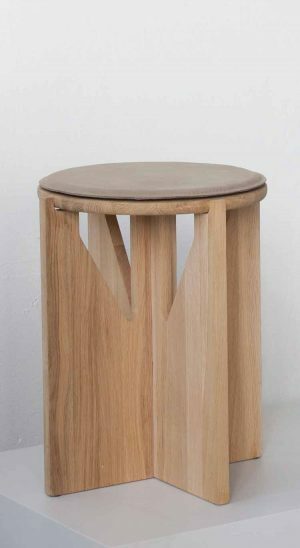 But I’m charmed by the stool and I think it’s a poduct that can find its use anywhere in the home. Also, the oak variant, I find, is really esthetic as well! Bauhaus Trolley is inspired by the influential German Bauhaus art school. The design of the serving trolley is light and graphical. Use it as a bar trolley, as a movable serving table or to exhibit your indoor herb garden or plants. The Bauhaus Trolley emphasises once more that simple design is beautiful. Available in black and white powder coated steel. Trolleys like this one are a real trend right now. Before people often only used it as a bar with bottles of alcohol, now you’ll find them in the living room as well as the kitchen, the bedroom or even the bathroom. 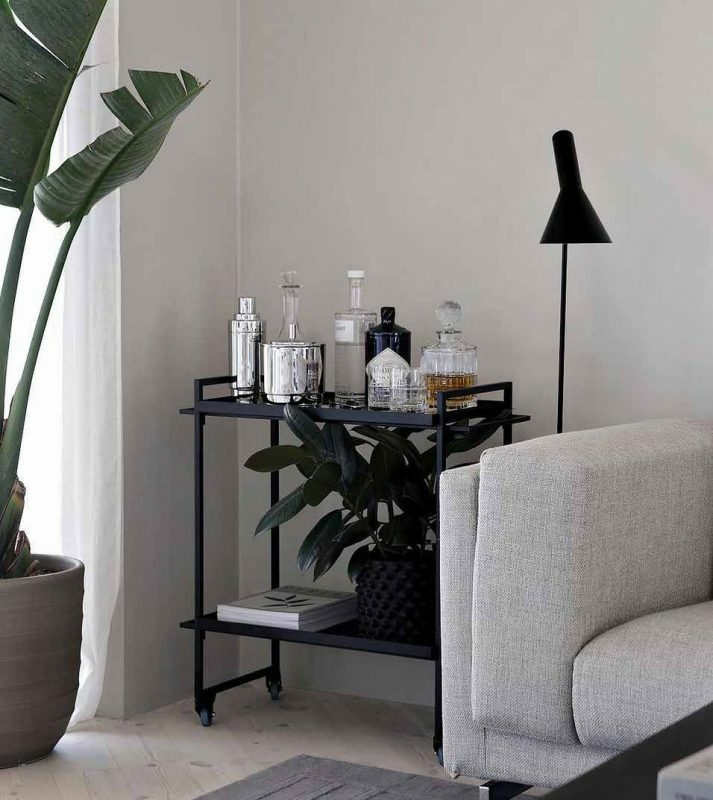 I’m a fan of this Bauhaus Trolley for its simple lines and the fact that it’s black. The trend shows mostly golden- or copper colored trolleys, but personally I think black’s more timeless. Standing on three legs these bowls make a distinctive apperance in any interior. Use the vessels to display fruit, asseccories or plants. Made from engobe colored terracotta and glaced inside to resist water. Elevate your home interior using these new classic bowls avaiable in four sizes. Dome Vases exist in four sizes with four different shapes and vase openings. The vases are made from terracotta with grey engobe. Glaced inside making them water proof and able to carry living flowers, lavish bouquets or branches. With all four in your home, you’ll always have the perfect vase for any occasion. 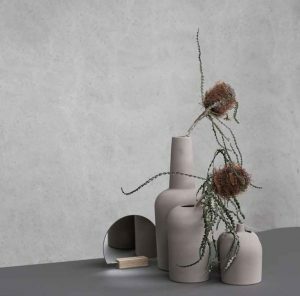 As far as these vases go and even more so the bols, it’s the originality of the shapes I really like. It’s not always easy to find ‘different’ vases or plant holders, and here they are. 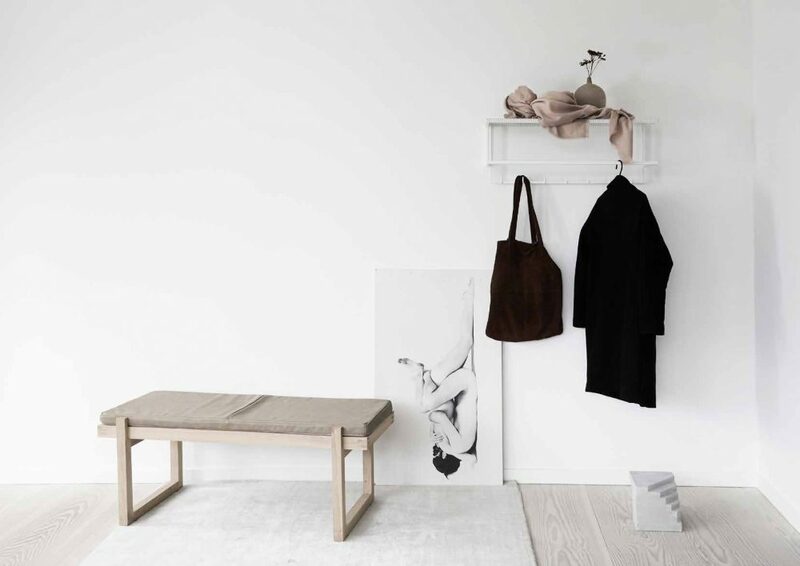 The Minimal Daybed combines Japanese and Scandinavian minimal design. The soft foam mattress is available in soft grey-brown aniline leather. 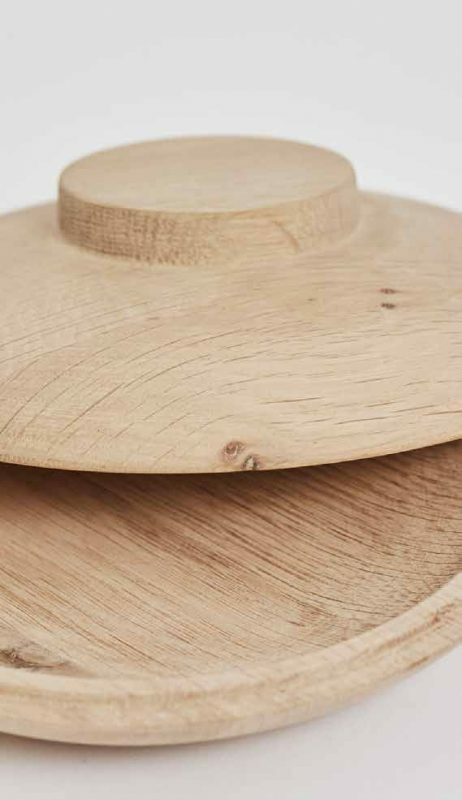 A stylish piece of furniture made of solid oak – a timeless classic. 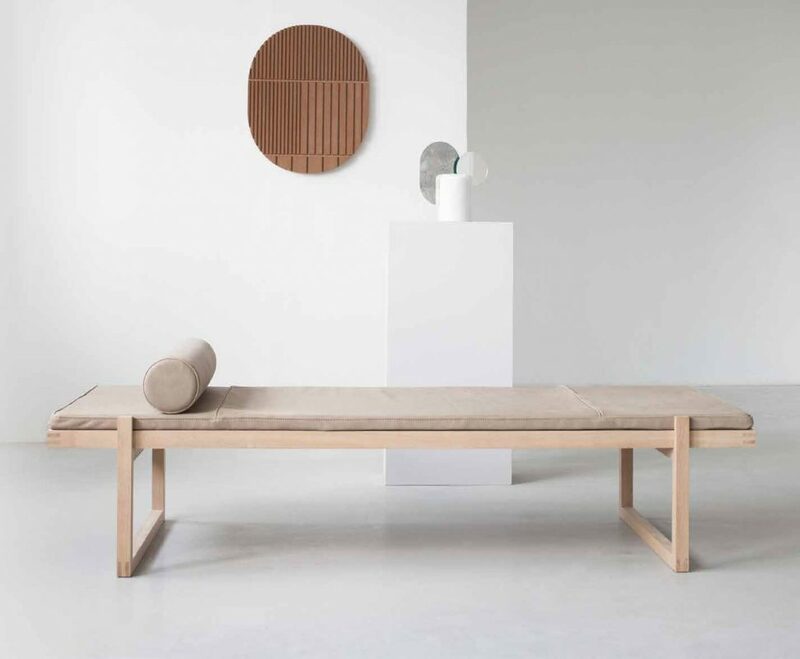 Minimal Bench is like the daybed – minimal and elegant. 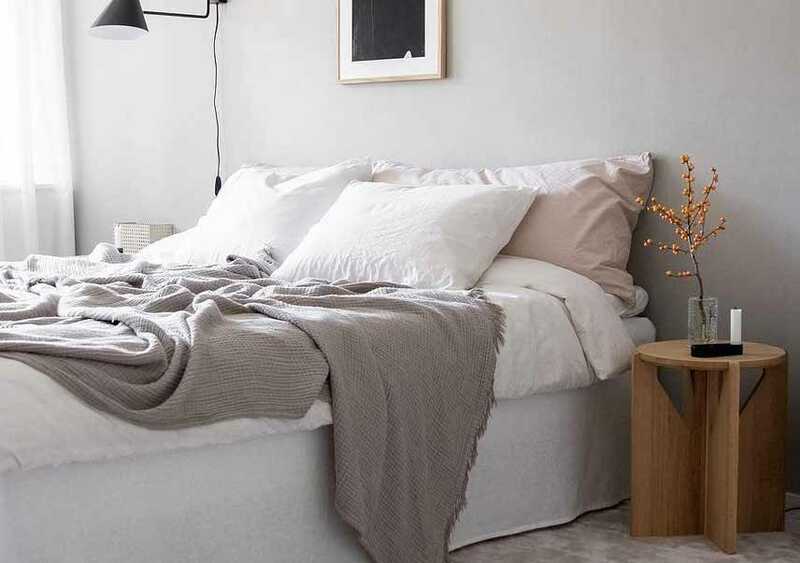 The soft foam mattress is available in a soft grey-brown aniline leather. The bench is spacious enough for two. You should kow that I have a soft spot for daybeds and I admit that this version of minimalist design by Kristina Dam is right up my street. I must admit that the foam mattress doesn’t woo me, because it doesn’t look very comfy. I’d rather pile on some lovely sofa-covers, with color (please). 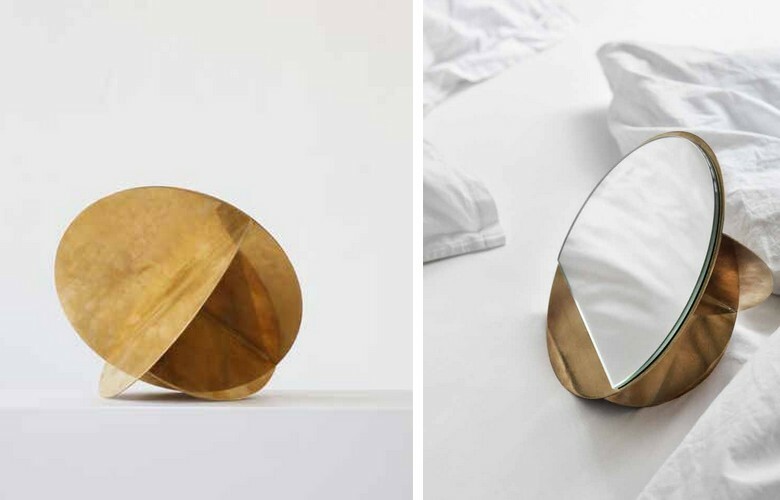 Mirror Sculpture is made of solid brass and will become even more beautiful over time. It’s both a make-up mirror and a piece of decoration, that will reflect the enviroment and light where you place it. I can’t say better than that. It’s beautiful, original and practical at the same time, what else should you need? The Book Keeper is a simple and sculptural way to arrange and put your books in order. Use the Book Keeper in your living room, on your bedside table, in the kitchen or at your office desk. 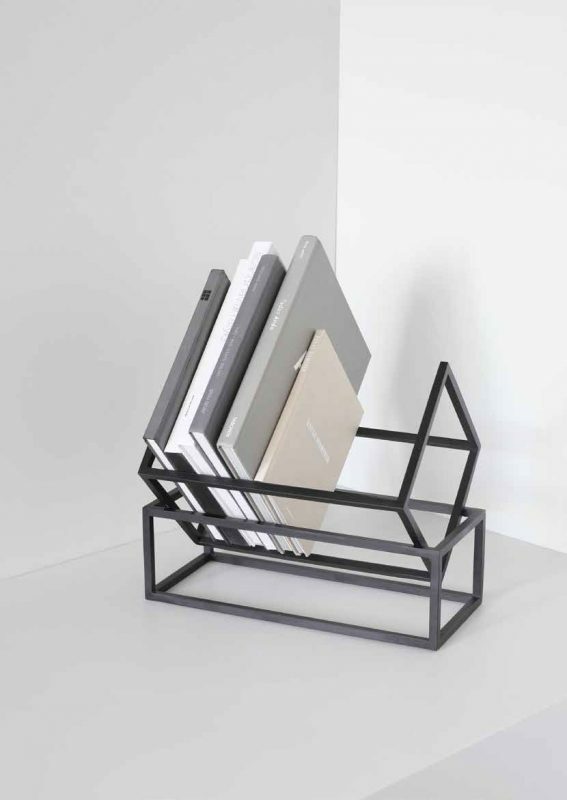 The Book Keeper is available in black and white powder- coated steel. I am not sure that I will put this magazine rack/book holder in my own home because the design is rather modern. That being said, I love its simplicity and the creativity of the idea. Mobile Mirror is a functional and graceful mirror that will blend in perfectly in your home environment. 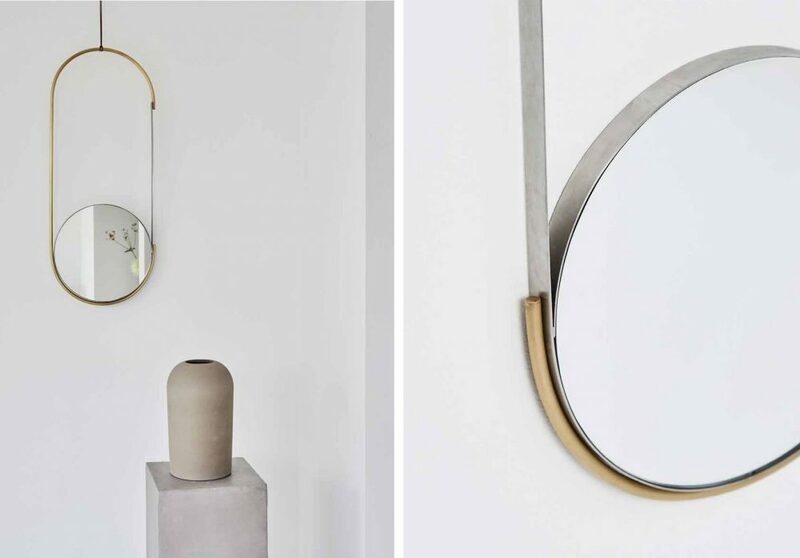 Still the Mobile Mirror is also a piece of interior art as much as it is a simple and useful mirror. It is made of solid brass and shining steel and the crystal clear mirror is on both sides of the mobile. Suspend it from the ceiling using the string and enjoy how the mirrors on both sides reflects the light and the surroundings. The designers text above says it all, it’s once again a practical AND beautiful product. As a work of art this mobile will play with light, I can but love it . Wooden Sphere and XL Wooden Sphere is two half turned wooden bowls that makes a perfect circle when united. Use the sphere for storage or separate the two bowls and use them as trays. Wooden Galaxy is a wider and lower version of the Wooden Sphere but just as beautiful and simple. Keep your jewellery in this irresistible vessel. Wooden Galaxy looks great together with the Wooden Sphere and is avaiable in solid oak or black painted hardwood. This is perhaps my favorite in this list of favorites. In the oak version they’re really such beautiful objects and since they have a real function, I’m totally fan. 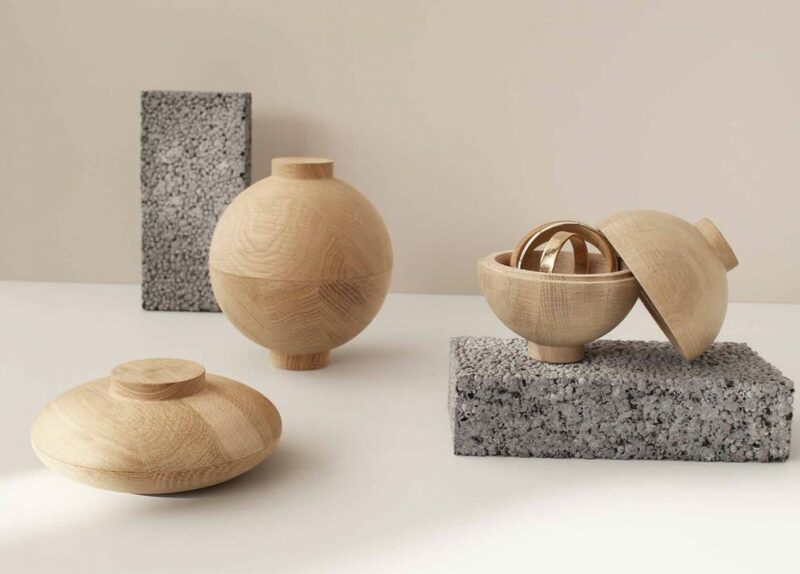 With all these great objects I’m concious that my budget doesn’t allow me to hope to get any for my home, nevertheless I’ll try to find out the price of these pretty spheres, you never know. 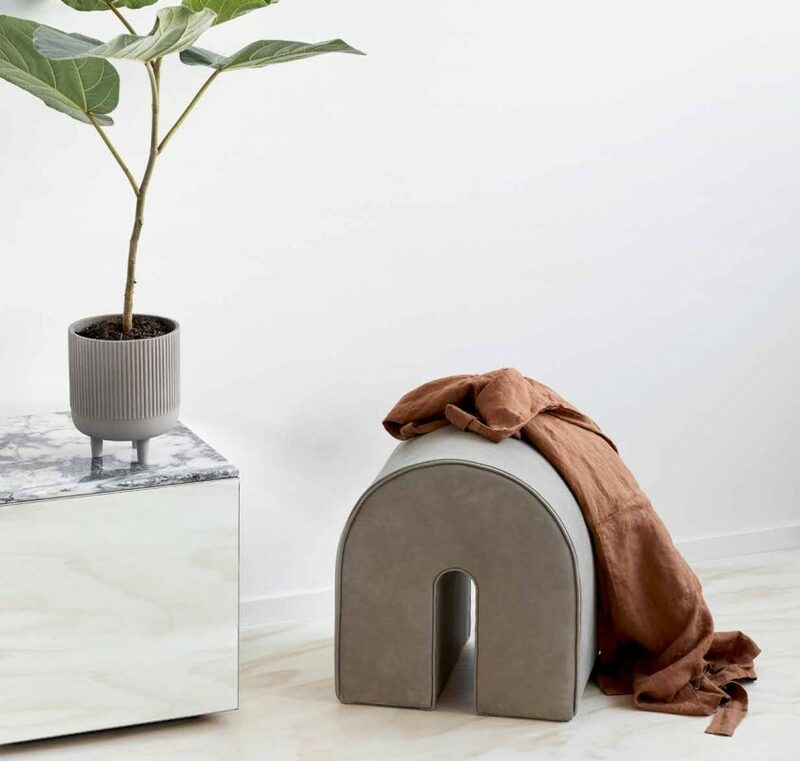 The Curved Side Table is a beautiful and timeless small table that combines a sculptural and handcrafted aesthetic. 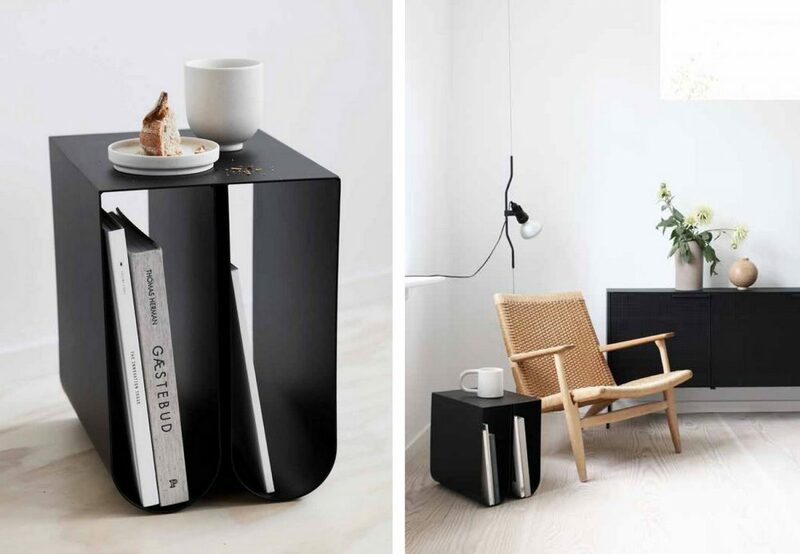 Made of slick black powder-coated steel this small side table is also able to store your magazines within its curved base. What else can I say? It’s simple, pratical and beautiful. I can very well imagine it as a nightstand for example, as well. 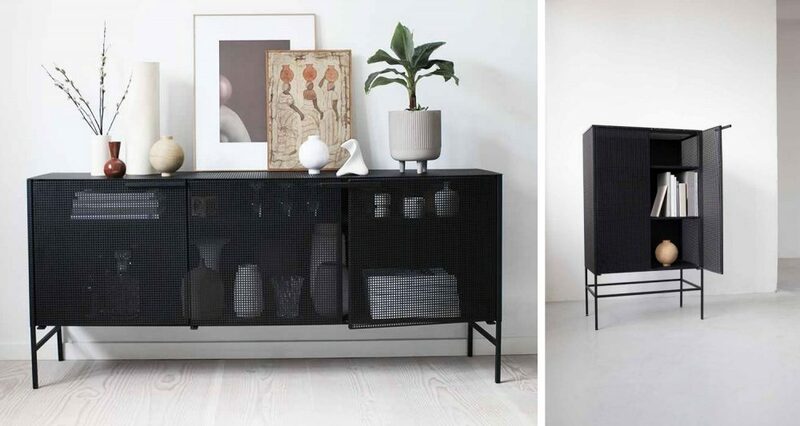 Grid Sideboard The Grid Sideboard is made of black powder coated steel. The sides and top plate are made of perforated steel. The Grid Sideboard is wellsuited for storing books, objects or dishes and the see-through aspect brings forth a light appearance. An elegant and large side board with a transparent design. Use it to display your dearest accessories or as a remarkable spacious storage unit for your office space. The Grid Cabinet is made of perforated steel and has a lovely black marble plate on top. An elegant cabinet with a transparent design. Use it for exhibiting accessories or as a remarkable storage unit. In these two pieces of furniture I like the transparency effect which mystifies somewhat the object it hides inside. Also, for those who like a more industrial or modern style, these two storage units can be a nice alternative to the trend of caned furniture. 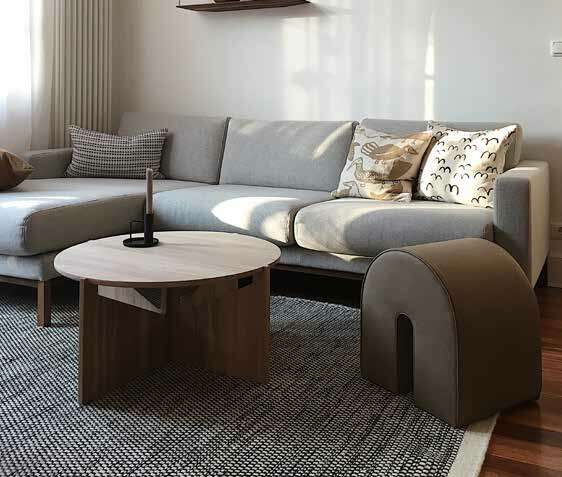 Poufs are in themselves a graphic element built up around simple principles. The Curved Pouf is made of exclusive aniline leather and the rounded shape of the pouf and its distinct design triggers our fascination of geometry. A state of the art Pouf. As far as I’mconcerned, a pouf is always a good idea. But seriously, a pouf works anywhere, right? And as for this specific one, it’s again the ‘haven’t-seen-this-before aspect that totally wins me. 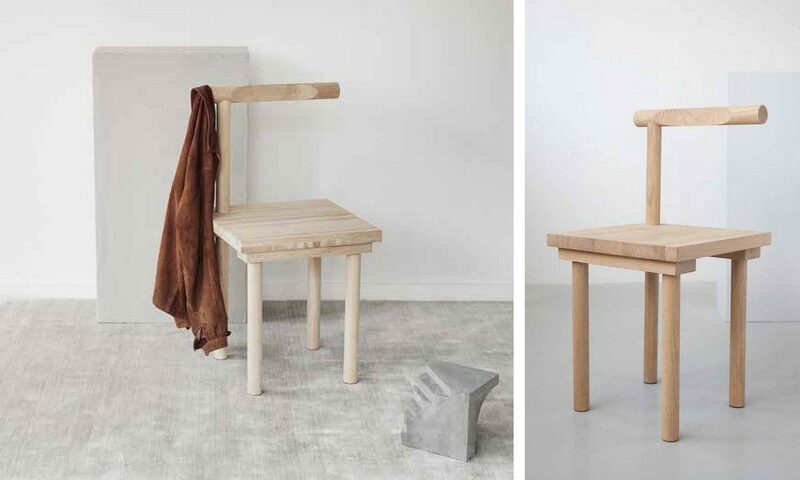 Use this piece of art furniture as any other chair or as a functional sculpture. You will notice immediately that the sitting comfort is remarkable too. I’d be curious to discover this remarkable comfort, how about you? But it’s true that it’s a chair out of the ordinary and again that’s what I like in this object. One of these chairs would have en effect and I would see it in a cocooning bedroom in natural tones. So there you go, lots of great design to discover by Kristina Dam. These danish designers, right? So what do you think? What object would you get for your own home? Next Post What is Japandi? And 6 ways to apply it at home.